To support the latest wafer processes involving increased density, multiple layers, and progressively higher steps, this type enables various macro inspection functions including transport (micro inspection), pattern-side macro inspection, back-side center and periphery macro inspections. Users can select from three models-TMB, TM, and T-according to their needs. 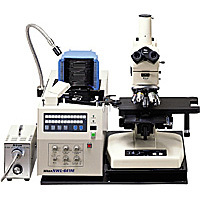 These models offer a variety of features, including non-contact centering controlled by photoelectric sensor to prevent contamination; a large, easy-to-read LCD control panel; and high throughput made possible by a multi-arm system that simplifies wafer loading and unloading; and support for both 150mm and 200mm?wafers. Vacuum chuck unit uses PEEK plastic so that the checked wafer is hardly scratched. An upgraded version of the NWL860TMB-SP/MB-SP, this model comes with an SMF elevator. Simply use the touch keys on the control panel to perform the main operations of this wafer loader. A wealth of observation functions-such as high-speed wafer exchange of approximately 2 seconds and Nikon"s proprietary "fluttering" mode-offer comfortable, effortless macro inspections.